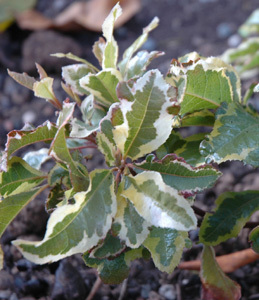 Joy Creek Photo Archive (c) all rights reserved We received the wonderful variegated shrub Ardisia japonica 'Dragon Brocade' from Dan Heims after one of his trips to Japan. The evergreen leaves have a high gloss and are lightly ruffled along their edges. They have a central green eye ringed by a broad green-gold band and often there is yet another dark green band along the margins of the leaves. The green-gold fades to an attractive cream with age. Tiny soft pink flowers bloom under the foliage. Late in the season these will develop into red fruits which persist through the winter. Spring to summer. 18 in. x indefinite.